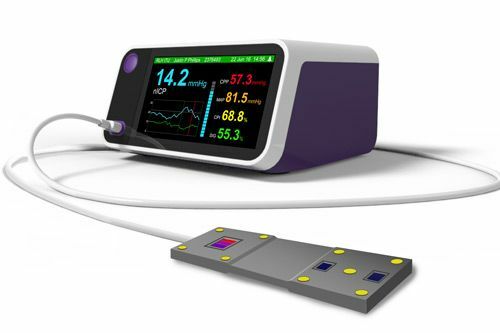 Thanks to a £510,165 National Institute of Health Research (NIHR) Product Development Award, biomedical engineering researchers from City, University of London, are developing a novel non-invasive intracranial pressure (nICP) monitor. The research project team comprises principal investigator, Dr Justin Phillips (Royal Academy of Engineering/Leverhulme Trust Senior Research Fellow) and Co-investigators Professor Panayiotis Kyriacou (Director of City’s Research Centre for Biomedical Engineering) and Mr Christopher Uff, Consultant Neurosurgeon and Head of Neurotrauma at the Royal London Hospital. Medical treatment received immediately after traumatic head injury is critical to the survival and recovery of the patient. Brain swelling often causes a rise in pressure within the rigid confines of the skull. This rise in so-called ‘intracranial pressure’ can cause a reduction in blood supply to the brain leading to irreversible injury or death in patients with severe head injuries. Standard pressure monitoring requires insertion of a sensor through a hole drilled into the skull by a neurosurgeon, a procedure that carries risks of life threatening bleeding and infection as well as a delay in starting the monitoring process. This research project aims to develop a system for continuous non-invasive monitoring of intracranial pressure using an infrared sensor placed on the forehead. The intracranial pressure will be displayed to the clinician in real time, enabling rapid assessment of newly admitted head injured patients to indicate the need for emergency procedures such as drainage of fluid from around the brain and allow doctors to plan long-term treatment. The proposed monitor could lead to significant improvements in survival rates, shortened hospital stays and reduced long-term disability. The technology could also benefit patients suffering from stroke, meningitis, hydrocephalus (water on the brain), liver failure and migraine. A final version of the system, designed for use in ambulances, emergency departments or intensive care units, will be developed and tested in healthy volunteers and hospital patients. “This award will enable us to develop a completely new technology with the potential to revolutionise management of traumatic head injuries as well as providing opportunities for better monitoring and treatment of patients with stroke. This is also a fantastic opportunity for collaboration with the Royal London Hospital, one of the world’s largest and most advanced trauma centres”.